The fine-wine market rose in every month of 2016 and finished the year on a high, both on its narrowest and broadest measures. The Liv-ex 50, measuring the performance of just five first-growth Bordeaux, gained 27 percent, and the Liv-ex 1000, spanning fine-wine regions around the world grew 22 percent, reaching an all-time high. The index in between these two, the Liv-ex 100, rose by 25 percent to outperform comfortably stock indices in the UK, the US, and Hong Kong, as well as gold. As discussed in the previous issue, this rampant upswing has been intensified by currency dynamics. The Liv-ex 100 is measured in pounds sterling, whose dramatic devaluation against dollars and euros rendered significantly cheaper wine bought on the important global market that is London, allowing prices to rise swiftly. The Liv-ex 100 grew 60 percent faster in the second six months of 2016 compared to the first six. However, it is clear that prices were already on the rise prior to any Brexit related currency effects. In the previous wine-market boom, Bordeaux was a region in a great hurry (the hare), the Bordeaux 500 index gaining 45 percent in the 20 months to July 2011 and the first growths a lot more. The index subsequently lost 19 percent over the course of 12 months, and, as of December 2016, remained 2 percent off its all-time high. A slower and steadier progression (tortoise-like) has paid off for regions such as Champagne and the “rest of the world” (Spain, Portugal, USA, Australia), at their highest levels ever, 56 and 59 percent up respectively over the seven-year period. Burgundy is something of a hybrid creature (imagine a mutant ninja turtle, if you will), having risen in the previous 2009–11 boom (though less precipitously than Bordeaux) and having resisted any subsequent crash, now 87 percent up since December 2009. Fast and steady is winning this race. Italy has not fulfilled post-boom high hopes. Having weathered the crash oblivious, Italy peaked in mid-2013 and then fell asleep at the side of the track for the best part of three years. Italian wines then moved with the pack until October, when they fell behind. They nonetheless finished the year up 14 percent, putting them well ahead of slow and stalling Rhône Valley counterparts. The Rhône is the only regional index other than Bordeaux not to have finished the year at an all-time high, but didn’t benefit from an earlier surge either, which means it has gained just 15 percent over seven years. Regional trends were one of the main topics in a fascinating New Year message sent out by Justerini & Brooks’ managing director Chadwick Delaney. The UK merchant, founded in 1749, last year celebrated 150 years of doing business with the United States. In some areas, J&B’s sales mimicked market movements explored above. “Burgundy continues to shine,” wrote Delaney (sales were up 24 percent year on year), while “Italy took a pause” (sales were down 9 percent). In other areas, J&B bucked the wider trends, with Delaney reporting that the “Rhône took off in 2016” (sales grew 441 percent). Germany grew even more spectacularly for the British merchant, by 576 percent year on year. Hew Blair, chairman of Justerini & Brooks, believes the “Riesling revival will continue” but says it’s “a J&B thing” rather than being a more general trend. Dan Jago, CEO of Berry Bros & Rudd, across St. James’ Street, cites Spain and South Africa as regions to watch. Blair concurs, saying, “Bordeaux en primeur will be a bigger success than we first thought, because quality is very good and there are big volumes, which means hopefully they’ll keep prices reasonable.” Delaney confirms that Bordeaux is “still by far the biggest region for us and our customers.” J&B is not the only merchant for whom Bordeaux still makes up the lion’s share of revenues; all will be hoping for a successful campaign later in the spring. Having shrunk by 5.6 percent in 2015, worldwide live auction revenues were up 3.1 percent in 2016. While 3.0 percent fewer live auctions were held year on year, each one yielded, on average, 6.3 percent more income. This is largely thanks to more lots in each sale (5.4 percent), while the sell-through rates were also up marginally to 91.3 percent. Growth was driven by Europe, up 12.6 percent, and the US, up 2.9 percent, while live auctions in Asia yielded 1.9 percent lower revenues than in 2015. In a reversal of recent trends, it was not New York that led growth in the US but Chicago, as well as the California cities of Beverly Hills and San Francisco. In Europe, all cities consistently holding auctions in both 2015 and 2016 saw growth, especially Geneva and Cannes. This has helped Europe begin to claw back a little bit of market share, accounting for 21 percent of live wine auction revenues globally, up from 16 percent to June but below the 26 percent it claimed in the second half of 2013. The US’s lead on Asia has been growing since it overtook the region in 2013, but the gap closed a little in the second half of 2016. Nonetheless, the US remains dominant, with 50 percent of revenues to Asia’s 29 percent. The US also retains the strongest sell-through rates, at 93.2 percent on average. In this year of the rooster, can Hong Kong continue to crow? 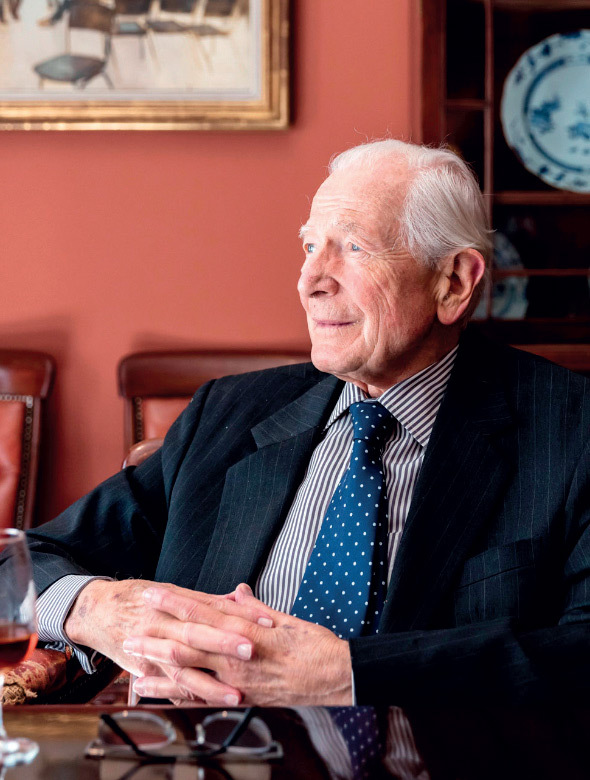 Michael Broadbent MW, founder of Christie's wine department, which celebrated 50 years in October. A new and shiny jewel in the crown of wine auctions is the Internet. Overall year-on-year growth rises to 4.2 percent if you include online-only sales held by the same auction houses included in our live-auction analysis. These houses are becoming more reliant on Internet auctions, which grew 22 percent in 2016 and now make up 7 percent of their total revenues on average. (This figure would be higher if Christie’s online-only auction revenues were disclosed.) Hart Davis Hart held its first such auction in July last year, while Sotheby’s, Bonhams, and some of the smaller regional auction houses are still holding out and concentrating purely on their traditional fodder of live auctions. This diet worked well for Sotheby’s, which brought in $72 million, up 19 percent on 2015, regaining its top spot in 2016. This put it comfortably ahead of number two, Zachys, which saw similarly strong growth and whose total was boosted, unlike Sotheby’s, by a significant chunk of online-only revenues (the largest of any live auction house, at $9 million). For several years having come first or second, Acker Merrall & Condit took third place in 2016, with revenues down 15 percent for the year, at $59 million. Growing only 3 percent year on year, Christie’s fell a place to fifth position, though if its undisclosed online-only wine sales totaled $4 million or more, this would be enough to put it back in front of Hart Davis Hart, which saw stronger growth. Heritage saw the strongest growth of the top seven, at 46 percent. Laurie Matheson, wine specialist at Artcurial, spoke of a “hyper-dynamic season from September to December,” referring to “prices holding and rising for the best wines and producers, and for the best provenance.” The examples cited all hailed from Burgundy (the goose), including “a lovely ensemble of Guy Roulot wines from Meursault, doubling or tripling estimates,” as well as Raveneau, Coche-Dury, and Domaine de la Romanée-Conti. Hart Davis Hart vice president Marc Smoler also cited “red and white Burgundy” as performing “particularly well,” with the Burgundy section of the December sale beating presale estimates. John Kapon, CEO of Acker Merrall & Condit, sharing his expectations for 2017, asserted that Burgundy will continue to produce “the most sought-after wines at auction due to a combination of smaller quantities produced and global demand increasing,” referring to added pressure from recent weather conditions resulting in “even smaller crops than usual.” He believes that 2017’s golden eggs will include the likes of Comte Liger-Belair and Fourrier. Martell was more circumspect with regard to Burgundy in general, however, offering a thoughtful and detailed analysis of the situation and likely direction this year. “Burgundy remains the most fickle market with the highest highs and some of the most surprising lows,” he stated. Puzzled by the lukewarm reception of the 2013 and 2014 vintages, he believes they will be “the biggest moving items in 2017,” due to “2016 being in such short quantity and with mixed quality along the Côte d’Or.” Martell expects this shift to take place as soon as March or April. A similar trend has been observed at Besch, whose resident wine expert Pascal Kuzniewski notes “very strong demand for Petrus and recovery confirmed for Lafite.” He also cites Haut-Brion, Margaux, and Mouton as attracting interest but sluggish demand for Cheval Blanc, while for Yquem, it’s “as difficult as ever.” For Kuzniewski, the biggest surprise has been the Loire, with great results for Clos Rougeard. Kapon says, “All indications are for a continuation of what we had experienced during 2016,” adding, “The American economy is quite bullish after the election, and we expect the pro-business attitude of the new administration to benefit the economy.” How this affects the wine market remains to be seen. Will Trump’s protectionist presidency hold the wine market captive or put wind in its sails? For the complete version of Liquid Assets, please refer to Issue 55 of the print magazine.